We were halfway down Excelsior, an intermediate-level trail that begins at the gondola on top of Little Whiteface Mountain, when Luke Meissner's radio crackled. A young skier had taken a nasty fall near the bottom of a trail called Easy Street and couldn't get himself off of the mountain. Stopping at the crest of a serious drop off where several trails intersect, Luke quickly consulted a map that was tucked into the breast pocket of his cardinal-red ski patrol jacket before pushing off. I tried to keep up as we hurriedly zigzagged toward the scene of the accident. Things didn't look too bad — the injured person was down but coherent, just unable to stand. A group of three ski patrollers were gently strapping the boy onto a sled, and then one of them grabbed the sled's handles and was off, dragging the injured cargo back to the main lodge. In just a few minutes, everyone had gone their separate ways and it looked as if nothing had happened. 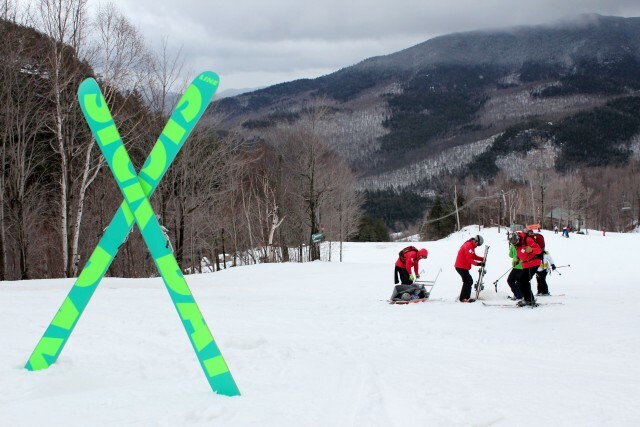 What I witnessed is a common routine at Whiteface Mountain Ski Resort, a downhill skiing and snowboarding destination that boasts the largest vertical drop in the East (3,430 feet), 86 trails, and 314 skiable acres. When people get hurt on the slopes, usually by falling and twisting something in a way it shouldn't be twisted, they need help getting down safely. On a busy day, injuries can happen more often than the paid ski patrol staff can handle.That's where people like Luke come in. He's part of the volunteer ski patrol, a group that's trained to monitor the trails and make sure everyone gets off of the mountain in one piece. "I think the biggest misconception is that we're the police of the mountain," Luke said. "We're just the safety people of the mountain. We're not going to arrest you or say you're breaking the law. We're just here to keep people safe." Luke grew up in Coreys, which is located between Saranac Lake and Tupper Lake in the Adirondacks. He tried cross-country skiing when he was young and took to it quickly. It wasn't long before the speed and challenge of downhill skiing began tugging at his three-pin bindings. "When I was 13, I started working summer jobs so I could buy a season pass to Big Tupper," Luke said. "Snowboarding, skiing, whatever I could do. 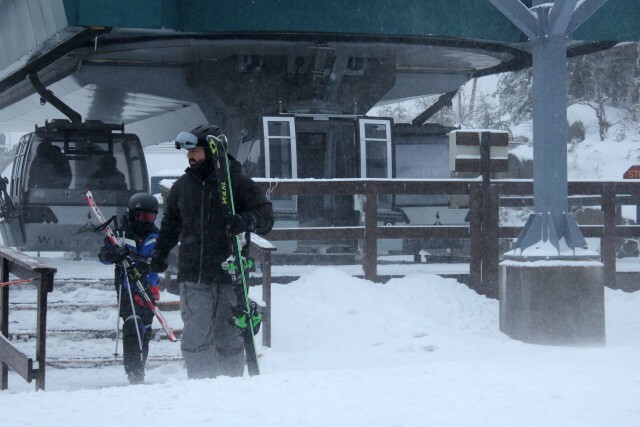 I actually only got to Whiteface a handful of times before I became an adult." Luke entered the Navy in 2001 and became a Corpsman — a field medical officer — for the Marines until 2007. During that six-year hiatus from snow, he took up water sports like surfing and water skiing. Those really seem like placeholders for his alpine pursuits, though. Luke is now in his third year of volunteering as a ski patroller, and it sounds like there'll be many more in his future. When he's not rushing to slope-side rescues, Luke spends time with his family, plays guitar like his life depends on it, and works as a nurse at a local hospital. He said his nursing skills are beneficial to the ski patrol, but the goals are different. 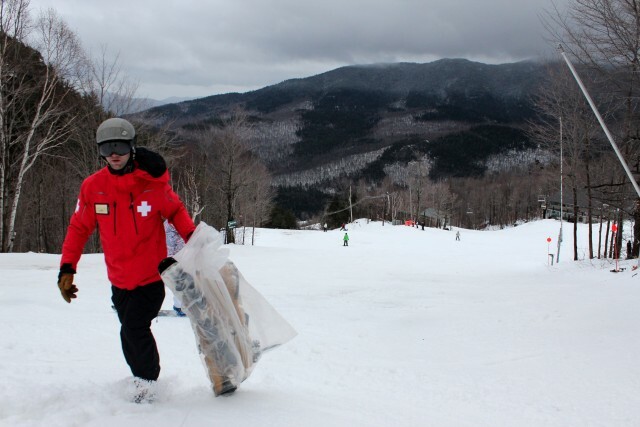 At Whiteface, rescuers focus on stabilizing the patient so he or she can be moved to a higher level of care if needed. With nursing, the goal is healing. Luke explained that's why his work as a Corpsman is indispensable. "That background is similar to this in terms of the tests we had to take," Luke said. "The exercises and the training that we do here are very similar to what we did in the military." 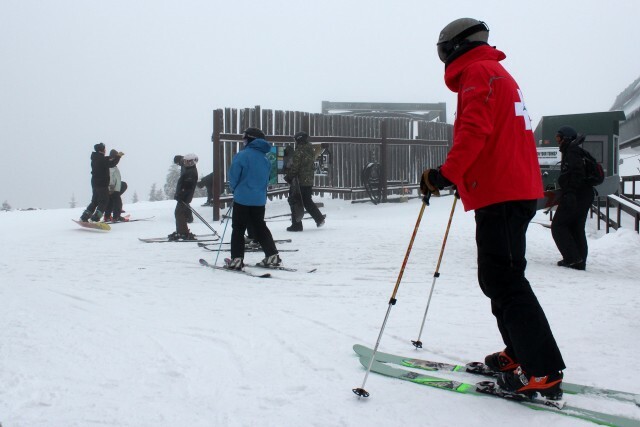 Volunteers don't need to be nurses, or to have served in the military, to join the ski patrol. They do have to pass an Outdoor Emergency Care course, which is offered every fall, and take an on-hill test to prove they're an expert skier or boarder. Every year the skill set must be demonstrated, and a refresher with senior patrollers at the beginning of every season helps facilitate that. It's really all about safety, assessing a situation, and knowing what needs to happen. Those skills don't just relate to people, either. 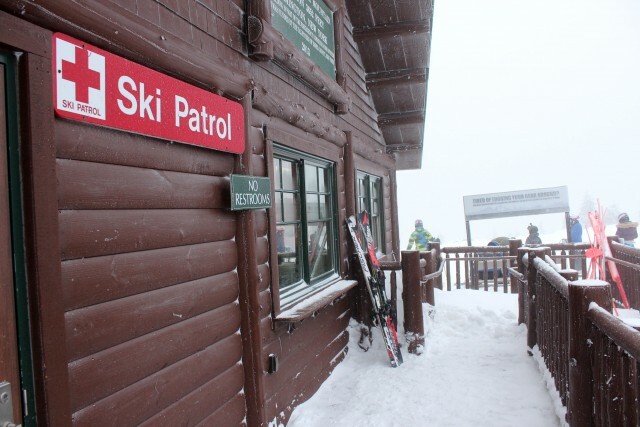 Every morning, the patrollers hop on the lifts to make sure they're running correctly. Then everybody runs down the trails to check their condition and to make sure hazards are clearly marked. All of that goes out in the day's trail report. Once the mountain opens, the patrollers busy themselves with a variety of things that include monitoring trail conditions, finding kids who were separated from their parents, recovering items dropped from chairlifts, and, of course, responding to rescue calls. Luke said the most common illnesses patrollers encounter are heart attacks, hypothermia, and gastrointestinal issues. The most common injuries are usually not too serious, and include sprained wrists, lower leg and shoulder injuries, and the occasional broken bone. Anterior cruciate ligament, or ACL, injuries are one of the most common leg injuries, and Luke said they can often be avoided. He explained that ACL tears are often caused by people trying to stand with their ski tips pointing downhill, which can result in the skis moving out from under the skier. The solution is simple: If you fall, stand with your skis perpendicular to the hill, and if you fall backward while moving, come to a stop instead of trying to stand back up. When a ski patroller arrives on the scene of an accident, the first thing they check for are the ABCs — airway, breathing, and circulation. Once those are happening, the next step is to assess the wreck to make sure both the patient and the rescuers are OK, or if they need to move to make the rescue safer. After that, patrollers radio in what is needed and focus on getting the injured party off of the mountain as quickly as possible. Once off the mountain, the patient is examined in the Medical Services Area to determine if more treatment or an ambulance are needed. "You can't do a thorough exam as I would do as nurse on the side of the mountain, because you risk things like hypothermia," Luke said. "But there's always plenty of help available. We're never on our own." Luke has never been involved in a rescue where someone's life was on the line, but there is one that stands out. A man was coming down Wilderness — a steep black diamond trail — at a high rate of speed, and he lost control and crashed into the trees. His only major injury was a broken femur, which was lucky considering he wasn't wearing a helmet. "He went through a stand of trees, and all he did was hit one and break his femur," Luke said. "I mean, that's a big, life-threatening injury, but if he had hit his head on one of those trees, he either wouldn't be alive or he at least wouldn't be the same person that he was before. That was an eye-opener to me." Luke explained that the man was a good skier, someone who had been skiing his entire life and could handle expert trails. He simply lost control while going fast and that was it. On a personal level, it reminded Luke to check his own speed and to not take the mountain's terrain for granted. A lot can go wrong out there, and being able to adapt is paramount to safety. "I don't think anything I've ever done here has gone completely by the book," Luke said. "There's always some little hitch, but that's part of the challenge. It's part of why I love it." There are several ways to get to the summit of Whiteface! Check out our blog on the options here. Not into skiing or snowboarding? Wait until summer and ride a fat tire bike down the mountain. While you're visiting Wilmington, eat at one of our local restaurants, and book a room to turn your adventure into a vacation!